I know the calendar insists January 1st is the start of the year, but for me, the year begins in September. As children return to school (muffled cheers), the air cools and nature’s autumn palate leaves us open-mouthed, I share with you ten resolutions for a writer’s new year. Yes, you may have made resolutions back in January, but look upon this month as another chance to start fresh. Work with me here, dammit. Here are September’s Resolutions. 10. I will get up from my chair once every hour and stretch. Yes, I know it’s risky to move and lose being in The Zone, but if I don’t, I end up being in The Soreness. Added Bonus: Hourly pacing and muttering. Never a bad thing. 9. I will remember that my keyboard requires a spill-free zone. Lesson learned on this one. That was a bad day. 8. I will turn the Internet off when I’m working. Somehow, Facebook will be able to muddle through without my presence. It hurts, but it’s true. 7. I will write down words I have to look up in the dictionary, so I can perhaps employ them myself and fool people into thinking I’m cleverer than I am. 6. I will remember that keyboards dislike crumbs almost as much as they dislike liquids. Furthermore, keys smudged with chocolate aren’t charming. They’re sticky. 5. I will remember I tend to get snappy when I don’t write for a few days. 4. Furthermore, manuscripts tend to not write themselves. Damn. 3. Surrounding myself with favourite things may be comforting, but it tends to minimize my actual writing space. Which is why I’m sitting here. Damn again. 2. I will remember that I cannot write brilliance every day. I will also remember that knowing this can’t stop me wanting to. 1. I will remember a dream will only become a goal when I have a plan on how to achieve it. Great post, Elspeth. I'm always advocating no.10 on Twitter: it really does make a difference. 6 & 9 are no problem - my desk is always a refreshment-free zone, but I know most people do indulge. 2 is my favourite. I write to the end of a story, no matter how long, before I ever start to reread any of it. That way, the story actually gets finished! Thanks for this. These are great, Elspeth. I could really relate to number 5, as I have been pretty snappy of late. Also thought number one was a great bit of inspiration. Thanks. My year begins in September too! Back-to-school was always my favorite time. Dani and Elspeth I agree! I feel much more serious about renewing myself to my work in September than in january. Love this! Good timing, because tomorrow is the Jewish New Year; I always get a 'second chance' in September! Huzzah for your resolutions to help you meet your goals, Elspeth ... as for moi, my long-standing resolution is to never make a resolution. Stuart; I've learned to channel my inner Dory and "Just keep writing, writing, writing" for the first draft. Otherwise, like you stated, nothing ever gets finished. Maryann; #1 is inspiring, isn't it? I don't know what came over me. Dani; It's always been my favourite month. Diana; Good luck! I cranked out my current first draft in 2 months, but then it was 75,000 words not 50,000 like Nano. Terry; Wishing you a peaceful New Year. Honey and challah for all! Christopher; I've had that resolution too. Wonderful, Elspeth! I've been trying to do #10 as well--I set a timer in the other room for half an hour, because I have some definite chronic pain problems resulting from sitting so much. Good luck to all of you with this "new beginning." No. 10 should be my No. 1. Heidi; Setting a timer in another room is an excellent idea. Pat, I spewed coffee! Hahaha. Spewing coffee comes under resolution #9. Just sayin'. Eslpeth - These. Are. Wonderful. I especially like #1. It all starts with the decision to actually do your dream rather than dream it. As a native of the Midwest, I've always had a soft spot for October with its brilliant colora that lead into the dormant winter but speak of the beautiful Spring that will blossom at its end. 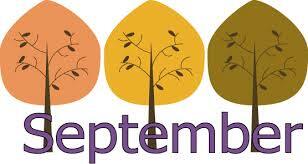 However, the thought of new beginnings remains as strong as it is for those who find inspiration in September.